If you are located in the United States of America and are in the process of securing a green card there you will in all probability be required to appear for the Green Card Medical. This exam is conducted by doctors who are approved, trained and appointed by the body governing the visa process in the United States – United States Citizenship and Immigration Services, or USCIS. Certain doctors are appointed by USCIS specifically to conduct and report the results of the Immigration Exam Medical. For those applicants who reside outside the country panel physicians can conduct the examination. The panel physicians are not the same as the Civil Surgeons inside the States; they are appointed by the Department of State – they can only conduct the immigration medical as a part of the visa process in a consulate or a U S Embassy abroad. Government-approved photo identification – such as a passport and a driver’s licence. Payment for the exam – prices vary from doctor to doctor, so it is always a good idea to check out a few doctors before deciding on the suitable Civil Surgeon. It is known that all applicants in the process of immigration to the United States must go in for what is called the Immigration Medical Examination. A USCIS-approved Civil Surgeon is entrusted with the task of medically examining the Green Card applicant to rule out any possibilities of danger that could exist to public health. Applicants are required to submit form I-693 to the immigration authorities. The form i-693 is filled up in part by the USCIS Civil Surgeon, that include details of the medical examination conducted on the applicant, along with details of certain necessary vaccinations. A new edition of the I-693 form will now go live from the month of July 2015 – from 27th July, 2015. Starting from 27th July only the new form will be accepted by USCIS authorities. The earlier forms, that is, the 01/15/13 or the 10/11/11 editions will no longer be accepted. Applicants are required to note this. easyIME is a one-stop-solution for green card applicants looking to schedule their immigration medical exam. This user-friendly free service streamlines the immigration medical exam process, providing Green Card Applicants with the most efficient USCIS-approved doctors and immigration lawyers right near their zip code. The revised I-693 forms will be made available for easy download for easyIME customers from June 15th, 2015 itself. So applicants, please take note! Please do not use the older forms. They will be rendered void by USCIS! www.easyIME.com is your friendly, easy-to-use Immigration Medical Examination Website, and is a service provided at no charge! It is absolutely free for all applicants who are in the process of applying for their Green Card or permanent residence status in the United States of America. This entry was posted on May 29, 2015 . 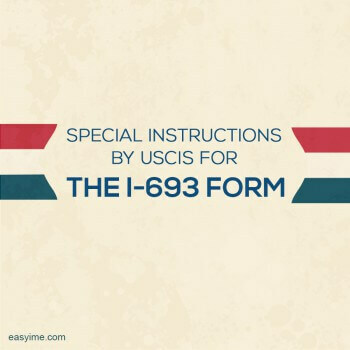 SPECIAL INSTRUCTIONS BY USCIS FOR THE I-693 FORM contd…..
WHAT IS THE PURPOSE OF THE I-693 FORM? The I-693 form is used to record results of the Immigration Medical Examination which the applicant for the Green Card appears for. This record is then submitted to the United States Citizenship and Immigration Services (USCIS). The Immigration Medical Examination is necessary to prove that the applicant is not made inadmissible on medical health grounds. The results of the exam are strictly confidential and are to be used for immigration purposes only. There are no fees for the form. Please note this. Choose an USCIS-approved Civil Surgeon to schedule an appointment for the examination. If you need help with the Surgeon log on to the USCIS website, or alternatively, visit the easyIME website to choose a best-priced surgeon. Fill out Part I of the I-693 form. Do not sign the form until you are asked to do so by the Civil Surgeon. The form should be signed only in the presence of the Civil Surgeon. Go through the medical examination on the day of the appointment, and have all your tests taken. This entry was posted on May 21, 2015 . 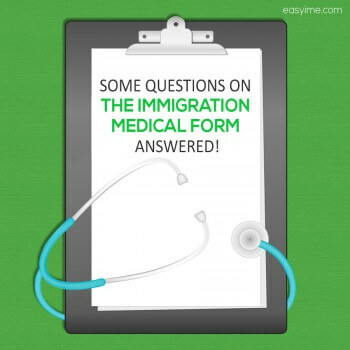 SOME QUESTIONS ON THE IMMIGRATION MEDICAL FORM ANSWERED! Q.1. What is the form for the Immigration Medical Examination in the U S called? The form that has to be filled up by the USCIS-approved Civil Surgeon conducting the Immigration examination is called the I-693 form. Q.2. How long is the signature of the USCIS Civil Surgeon valid on the I-693 form? The signature of the Civil Surgeon is valid for a period of one year on the I-693 form. As per USCIS laws every applicant who is applying for the Immigration Medical Examination and is applying for adjustment of status should get the medical and vaccination schedule formalities completed as close to the submission of the I-485 form as possible. Q.3. What does the Immigration Medical Examination involve? As and when the entire Green Card Medical Examination is required to be conducted the USCIS Civil Surgeon is responsible for ensuring that all the necessary procedures are performed satisfactorily. 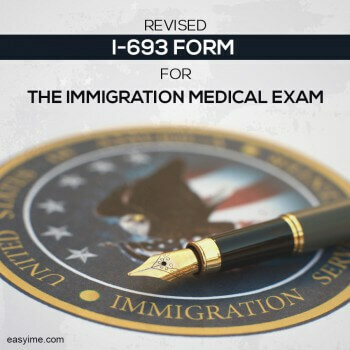 The results of the Immigration Medical Examination will then be recorded by the Civil Surgeon on the I-693 form that contains the results of all parts of the examination conducted. Physical Examination 2) Mental Evaluation 3)Tuberculin Test and 4) other stipulated vaccinations. This entry was posted on May 15, 2015 .